Many early novels were cosmopolitan books, read from London to Leipzig and beyond, available in nearly simultaneous translations into French, English, German, and other European languages. 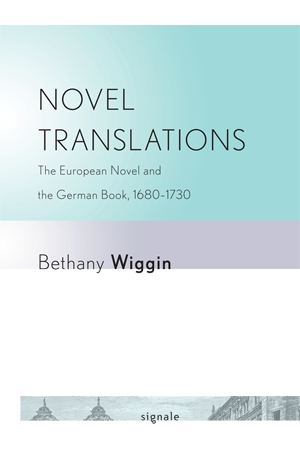 In Novel Translations, Bethany Wiggin charts just one of the paths by which newness—in its avatars as fashion, novelties, and the novel—entered the European world in the decades around 1700. As readers across Europe snapped up novels, they domesticated the genre. Across borders, the novel lent readers everywhere a suggestion of sophistication, a familiarity with circumstances beyond their local ken. Into the eighteenth century, the modern German novel was not German at all; rather, it was French, as suggested by Germans' usage of the French word Roman to describe a wide variety of genres: pastoral romances, war and travel chronicles, heroic narratives, and courtly fictions. Carried in large part on the coattails of the Huguenot diaspora, these romans, nouvelles, amours secrets, histoires galantes, and histories scandaleuses shaped German literary culture to a previously unrecognized extent. Wiggin contends that this French chapter in the German novel's history began to draw to a close only in the 1720s, more than sixty years after the word first migrated into German. Only gradually did the Roman go native; it remained laden with the baggage from its "French" origins even into the nineteenth century. Bethany Wiggin is Undergraduate Chair and Assistant Professor of German at the University of Pennsylvania.